The location of the farm makes it ideal to host groups of people who want to enjoy their natural environment during any season. We have a group of collaborators who program outdoor activities of all kinds. 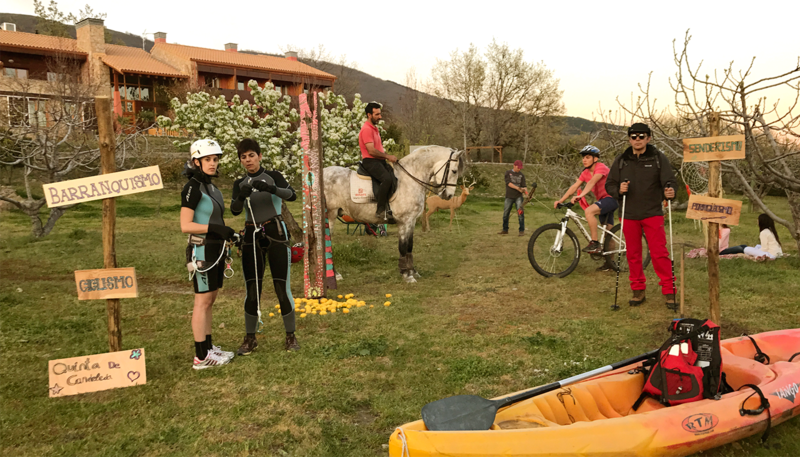 Routes on horseback, by bicycle or hiking. Excursions to the natural pools of gorges that come down from the mountains. Ascension to the summits of Gredos with snow. Initiation to climbing and canoeing. Recognition of native fauna and flora. Visits to the Monfrágüe and Cabañeros National Parks. If you have a group and want to organize your own itinerary of activities we put at your disposal the comforts of our premises, from the lodging to a specialized chef to make your stay perfect. Not more than two hours from the place you can visit cities like Avila, Toledo, Salamanca, Cáceres and Trujillo. They produce products of recognized international prestige such as Iberian acorn ham, Casar cake and goat cheese. Special mention must also be made of the wines of this central western area of Spain. You will be able to visit wineries of recognized prestige of Ribera del Duero, Toro, Extremadura and Castilla La Mancha. Typical gastronomic varieties: The roasted kid, the lamb and suckling pig, the potatoes “revolconas”. The Park of Monfragüe: receives more than 300,000 visits a year, is characterized for be a unique bird observatory in Europe, in the black vulture or the white imperial eagle, species in danger of extinction. The Park of Cabañeros: with more 42,000 hectares is a great botanical wealth that show unique ecosystems in which 22 species are inhabited as vulnerable or of special interest. The mountain ranges that surround the farm offer an excellent opportunity to begin the climbing activity. We organize days of climbing with the help of qualified professionals, in which groups of people will be able to try during their stay the experience of climbing in the nearby mountainous areas. We also make the farm available to groups who want to organize their own climbing or canyoning itineraries.